"There's more than one way to get creative in the kitchen! Make cute little sheep from cauliflower florets. All you need are black olives, fresh cauliflower florets, raisins, dry black-eyed peas, and toothpicks. Olives and black-eyed peas become the heads and eyes. The legs are raisins. Don't play with your food? Well, not this time. So much fun." Hold 1 olive, pitted end facing up as the top of the head. Use a small paring knife to make 2 shallow holes the size of a black-eyed pea in the 'face' of the 'head'. Press each black-eyed pea into each hole, black eye facing outward. Cut 2 slits from the top of the pitted hole of the 'head' to be placeholders for the 'ears'. Cut 2 small lengthwise strips from the remaining black olive, and discard the remaining olive piece. Slice olive flesh away from each strip to create sheep 'ears'. Slide the 'ears' into the slits on the 'head'. Press 2 toothpicks close together into one end of the cauliflower floret and secure the olive 'head' onto the toothpicks. Thread 3 raisins lengthwise onto each of the 4 remaining toothpicks. Skewer 1 final raisin, crosswise, at the base of each toothpick to create 'hooves'. Secure the toothpick 'legs' into the bottom core of the cauliflower floret to create 4 equal-length 'legs'. 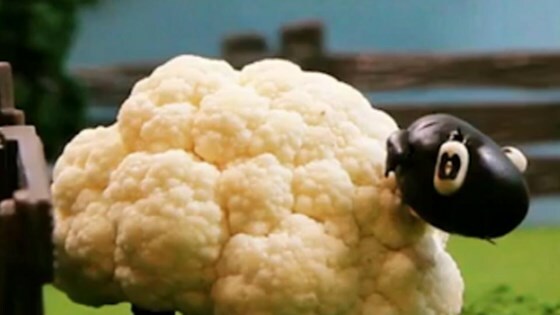 Garnish the kids’ plates with too cute cauliflower sheep. A very clever Shaun the Sheep! Kids loved it… I love it!